iPhone/iPad is one of the most popular devices in tech world. In recent years, iDevice gained huge popularity all around the world because of its unique design and features. Apple servers every age group including children to people in their 70’s. People take lot of photos every day, and at the end, it gets difficult to handle huge bulk of those photos. This bulk also include such photos which are not perfect or are miss clicked. So how to delete photos from iPhone/iPad to free up iOS 12 storage? And what about the meaningful photos that you want to save forever? Well, the following are the solutions. Step 1. Open Photos app on you iPad. Step 2. Tap on the “Photos” icon at the bottom. Step 3. Now tap on “Select” option from the top right. Step 4. Tap on "Select Next" in order to select set of photos instead of single photo. Step 5. After selecting the photos you want to delete, click on the “Trash” icon to delete them. Step 6. Last step is to confirm that you want to delete photos and then you are done. Sometimes you may want to compress photos because there is no need to keep such big HD photos. But you find it is not easy to do so. 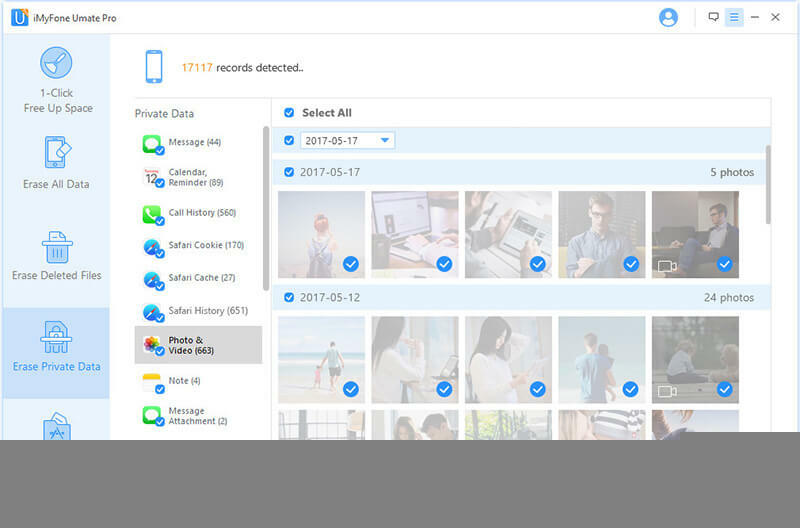 Or sometimes you would like to permanetnly erase unwanted photos to avoid privacy leak. However, when you come to iMyFone Umate Pro or iMyFone Umate Pro for Mac, all the cases can be figured out here. Option 1: Using its compression feature to compress your iOS 12 photos, it will not damage the visible quality but you will have more 75% photo storage space. You don't need to do it one by one. All the photos can be compressed once. Step 1: Connect your iPhone/iPad to computer and hit "Photos" tab at the interface on iMyFone Umate Pro. Step 2: Choose "Backup & Compress" and it will start to transfer original photos to computer and then start compression. Option 2: iOS 12 Photos can be permanently deleted since iMyFone will apply overwriting technologies to rewrite the original photos. Erase Existing Photos: As for the unwanted personal photos, do not leave them any chance of recovery. 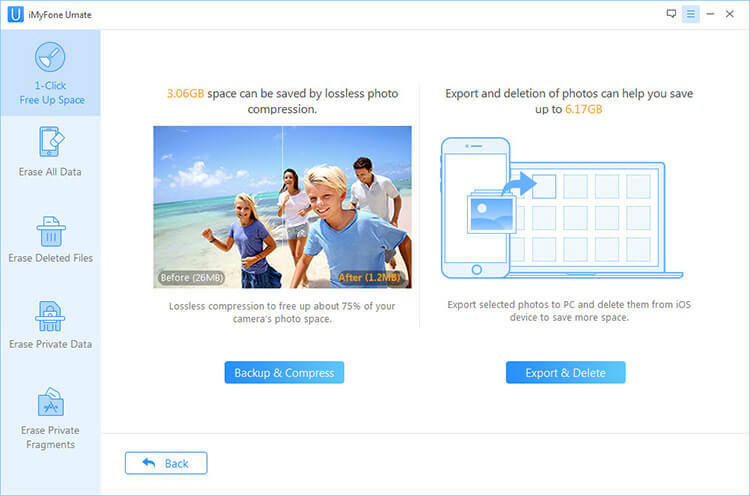 Run the "Erase Private Data" to delete photos and the deleted photos is permanently gone, 100% unrecoverable. Erase Deleted Photos: If you manully deleted photo before, it is the best choice you should have. Simply deleting photos which are still under the risk of recovery can be found out and permanently destroyed. 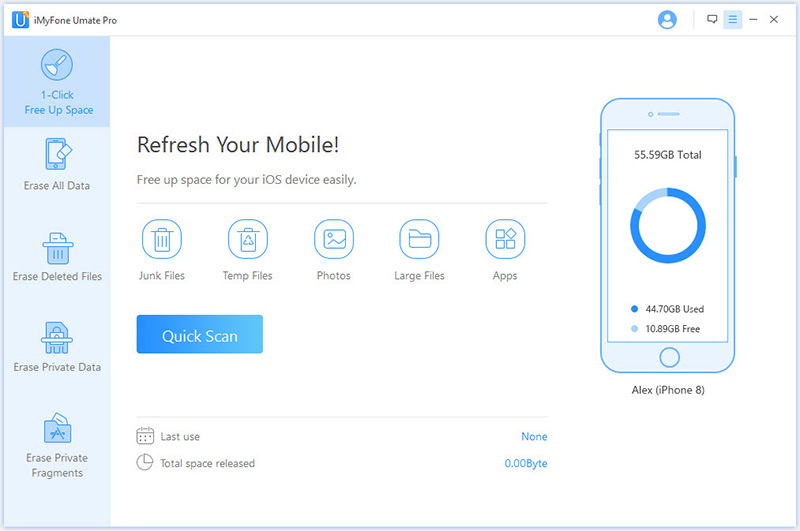 Furthermore iMyfone Umate Pro can also clean all junk files from you iOS 12 device. This is for FREE trial. Photo cache is inclusive.